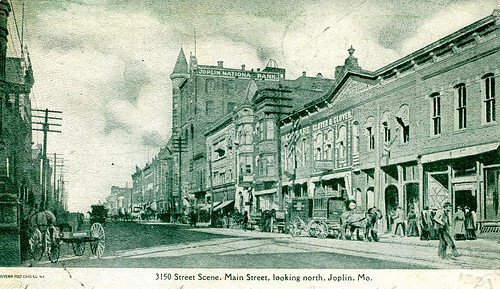 In the spring of 1908, a Joplinite ventured far from home and landed in “cultured Boston.” The gentleman, E.F. Martin, sent a letter back to his friend, John P. Frank in Joplin, and offered in colorful terms his feelings on visiting the historic town. In the process, we’re offered a glimpse not only in the words Joplinites chose to represent their feelings, but also what they felt was proper from low heel shoes on women to modern day Yankees. “Boston, Mass, April 28, 1908. I have had so little to do today that I am awfully lonesome and thought possibly I might work some of it off on you. Boston is an older town than Joplin. You can tell that by the dates on the head-stones at the burying grounds. I went in to the ‘Arm and Bella,’ an old hold-out and had a drink of real musty ale sitting in the same place where Nathaniel Hawthorne used to sit and tell stories. Sunday I visited the Old South Burying Ground and while walking about in there found the grave of Paul Revere. You remember Paul. He became excited one night when he saw a light in the old South meeting house and got on his horse and rode out into the country giving the alarm that the Britishers were about to get them. If the average Yankee was then as he is now it is a durned pity that the Britishers didn’t get them all. Boston is a real nice place, though, for a day or two – not for a whole month. I would much rather be down in Stone county, Missouri, catching speckled bass. Talk about fish, they sure have it here in plenty. I have sampled everything in the fish line since coming, except an octopus. I think I shall order planked octopus net. I spend some of my leisure time on the Commons. This is the place spoken of in Saint Matthew where the British soldiers broke the ice in the ponds and the school boys went and told on them for it. Served them right, eh? I was in New Haven, Conn., the first of the month and tried to buy some wooden nutmegs, but could find none. I will try and get you some postals showing pieces of interest – ancient interest. The old state house is still here and is used for a depot for the subway. Faneuil Hall – the Cradle of Liberty – is here down on State street. Armour Packing company have the first floor rented and there is a large sign out telling the people that Armour’s dressed lambs are the best. I think that is simply awful. I wish I had someone with me to walk around with and kill time. I am stopping at the “Tavern.” Tolerably good place. There are no large department stores, but many shops. There are no Jews here here that I have seen and but very few negroes. I was down on the wharf last week and saw an ocean vessel come in from the South loaded with bananas. I was there again this morning and they are still unloading bananas. The vessel will carry about 100 car loads. From things here in general I don’t wonder that our forefathers wanted to go west. I have that same feeling, and it makes me glad to think that I can start Saturday noon. Doggone me if I hadn’t rather live in Carl Junction, Saginaw or Carthage, than in cultured Boston. The ladies here all wear low heel shoes like a man. The men all smoke pipes. I wonder why until I tried some of their cigars. Of course there are plenty of places of interest, but one grows tired of looking at sights highly valuable because of their age and historic surroundings. “Cherryvale, Kan., Oct., 21, 1907. Joplin City Marshal, Joplin, Mo. “Cassville, Mo. 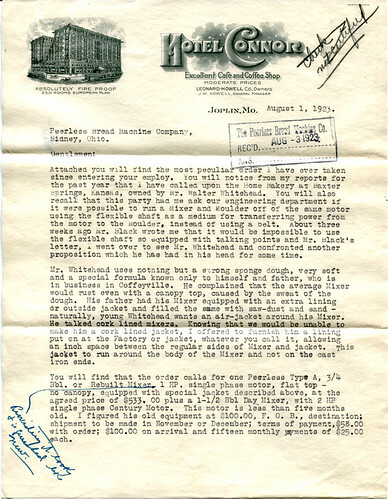 Oct. 22, 1907. Chief of Police, Joplin, Mo. “City marshal, be on the lookout for a young colored woman by the name of Leatha B—-. She is a brown skin, good looker, good hair, a pair of earrings with blue sets, and a finger ring with a blue set in it. She might go by the name of Leatha C. She wears a long black coat, a black hat turned up on the side with a band with a red stripe in it, a nice black dress, and a changeable silk underskirt. I just bought them for her. There is a young brown skin man by the name of Will Julien. If you catch them arrest them both and lock them up until you hear from Butler or Mr. George Julien. If she is there and ain’t working and running the streets, make her leave town. Yours truly, Andy B.
P.S. – Make her come home; she ain’t got no business down there. I have got a good home for her and she don’t want for nothing. Make her leave town. She left this afternoon at 3 o’clock. 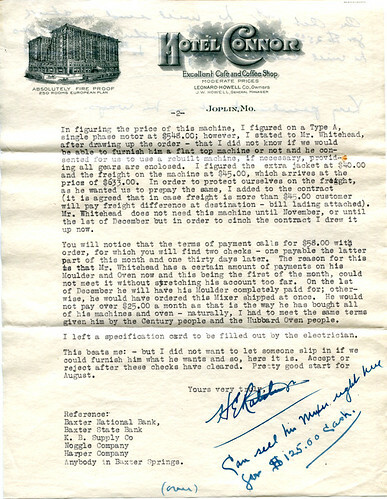 Telephone back at my expense.” – Andy B.
We’re not sure if Leatha returned to Andy B. in Fort Scott or not, but it was probably not the last time that Chief Myers received a letter from the hopeful and the lovelorn.